Western North Carolina Vacation House Rentals - Cabin for rent near Nantahala White Water Rafting - Nantahala N.C. Swain County. 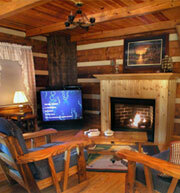 Romantic mountain lakefront log cabin for rent on cool high elevation Lake Nantahala. 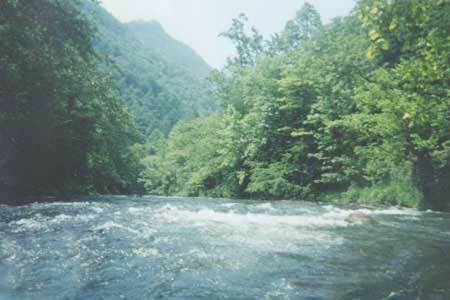 Close to Nantahala River Gorge fly trout fishing and Nantahala White Water Rafting. 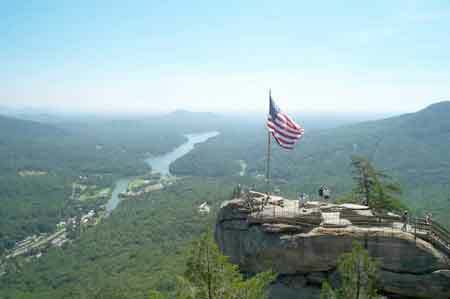 Western North Carolina Mountain vacation rentals. 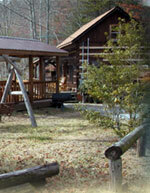 NC vacation log homes and cabins for rent. NC Vacation cabin rentals. 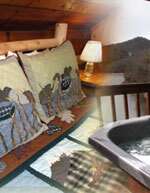 Vacation Cabins for rent near the Blue Ridge Mountains, Great Smoky, Smokey Mountains National Park. 'Moonlight Reflections' vacation rental cabin. 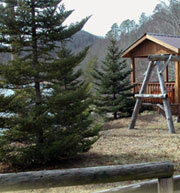 Quiet and private location on Lake Nantahala. Would you like to get away from it all? …escape to a romantic cabin in the woods beside a crystal clear mountain lake? A private place where you can lose all track of time? … fish… swim… take a leisurely boat ride? 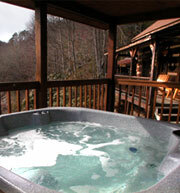 Or just wile away time in a relaxing hot tub? Moonlight Reflections is that place. A hand-built, two-bedroom log cabin hideaway on a remote mountain lake between Franklin and Andrews, in Western North Carolina. Definitely off the beaten path, and well worth the drive. Inside, you’ll find all the comforts of home — a cozy living room with a fireplace and entertainment center, two bedrooms with queen beds, one and a half baths and a full, well-equipped kitchen — a North Carolina mountain cabin that comfortably sleeps four. With everything this cabin offers, you may not want to get back in the car. But in the event you should decide to add a little adventure to your getaway, you’ll be just a short drive from the whitewater rafting and kayaking on the Nantahala and Ocoee rivers. Plus all the great activities the North Carolina Smokies have to offer. If all this sounds like the perfect getaway…it is. or call us at 678-383-4231. Moonlight Reflections is an air conditioned true Appalachian-style, hand-crafted log cabin, with an all-wood interior, tongue and groove plank pine floors, and a covered front porch complete with rocking chairs and a porch swing. The builder’s ingenuity is evident in many places, especially in the alternating-tread stairs to the second-floor bedrooms and half-bath. 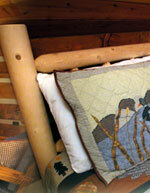 With queen beds in both bedrooms, this Nantahala cabin sleeps four. In the living room, there’s a gas-log fireplace and an entertainment center with big-screen TV, VCR, DVD, and DSS Satellite with a large choice of music and entertainment channels. The cabin’s full bath is complete with an old-fashioned claw-foot tub with shower. And the kitchen has everything you need to prepare all your meals at the cabin — refrigerator, stove, microwave, coffee-maker, dishwasher, eating and cooking utensils. 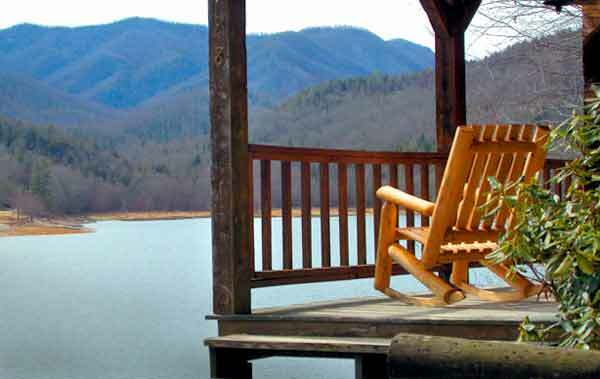 Outside, the cabin has an over-sized gazebo with a hot tub, picnic table and panoramic view of beautiful Nantahala Lake. There’s a large, drum-style charcoal grill, a private dock, and a front lawn with a hand-built, two-person swing overlooking the lake. This cabin is perfect for a honeymoon or anniversary with its cozy fireplace and romantic hot tub spa; at the same time the spaciousness of the cabin makes it perfect for a small family. The steps to the upstairs bedrooms and the path to the lake are both steep and may not be easily negotiated by some guests. Moonlight Reflections has everything you want in a Lake Nantahala cabin rental. There's plenty to do in the area. Moonlight Reflections is just a short drive from the white water rafting and kayaking venues on the Nantahala and Ocoee rivers. That's in addition to all the great activities the North Carolina Smokies have to offer -Boating on Nantahala Lake - You may bring your own boat or jet ski, or rent Moonlight Reflection's private pontoon boat (after signing a liability release). 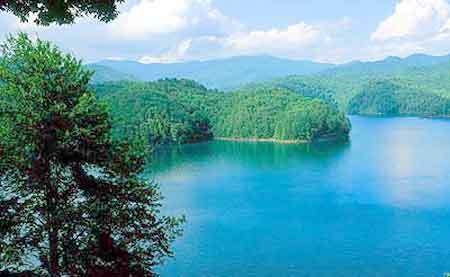 Fishing- A relatively low number of boaters makes Nantahala a great fishing lake. You'll find walleye, crappie, sunfish, trout and bass all available for your private fish fry at Moonlight Reflections. And below the dam, where the river cascades toward the Nantahala Gorge, you'll find some of the best fly fishing spots in the eastern US. Horseback riding- Several nearby stables, including Lonesome Dove Stables, offer guided trail riding. Great Smoky Mountains Railroad, in nearby Dillsboro and Bryson City, offers several scenic excursions. Mountain Biking - The nearby Tsali trails offer some of the best mountain biking trails. Bikes can be rented at the Nantahala Outdoor Center . Other nearby things to do- Great Smoky Mountains National Park Cherokee Indian Reservation Biltmore House Cherohala Skyway Blue Ridge Parkway. reserve now for next fall. This lake front, lakefront Vacation Rental Cabin is on Lake Nantahala, near Nantahala River White Water Rafting, Nantahala Outdoor Center, Nantahala River and Lake Nantahala River trout fly fishing, USFS Tsali Recreation Area Mountain Bike Trails, Appalachian Trail hiking, Joyce Kilmer Memorial Forest, Lake Fontana and Fontana Dam, Great Smoky Mountains National Park, Cades Cove, Great Smoky Mountains Railroad Excursions Train, Cherokee Indian Reservation, Cherokee Harrah's Casino. A 1.5 to 2 hour scenic drive from Asheville NC airport, Biltmore House in Asheville, Atlanta GA, Knoxville TN and Chattanooga TN. Less than 1 hour to skiing at Cataloochee NC, near Maggie Valley. 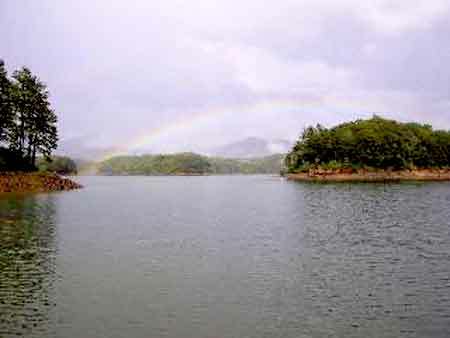 Lake Nantahala, Nanthala, Nantahale, Nantala. Western North Carolina holiday, vacation rental home, cabin, chalet close to Great Smoky Mountains National Park, Cades Cove, Blue Ridge Parkway, spectacular waterfalls, antique and Appalachian craft shopping, Smoky Mountains Country Club Golf Course, skiing, horseback riding, whitewater rafting, hiking, mountain biking, & kayaking on the Nantahala River. Ride the Great Smoky Mountains Railway. Visit the nearby Cherokee Indian Reservation and shop for Native American Indian crafts. Only a short scenic drive from the Appalachian Hiking Trail, Biltmore House and Gardens, Blowing Rock, Cherohala Skyway, Cherokee Bear Zoo & Exotic Animals, Cherokee Indian Museum, Cherokee Indian Reservation, Deep Creek Tubing, Fields of the Wood, pontoon boating on Fontana Lake and Dam, Great Smoky Mountains National Park, Great Smoky Mountains Railway, Harrah's Cherokee Casino, Joyce Kilmer Memorial Forest, Linville Caverns, Mountain Farm and Museum, Nantahala National Forest, Nantahala River Rafting, Oconaluftee Indian Village, Pisgah National Forest, Santa's Land, Smoky Mountain Country Club, Soco Gardens Zoo, Tribal Bingo, Tsali mountain biking, Unto These Hills, Darnell's Corn Maze. Lake Chatuge is a beautiful clear water lake surrounded by mountains of both Georgia and North Carolina. The sprawling fingers with many islands and coves cover 9000 acres and have 200 miles of shoreline. A great majority of the Lake Chatuge borders USFS national forest or is owned by Tennessee Valley Authority and is undeveloped. 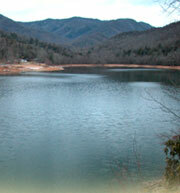 Lake Chatuge is known to have good bass fishing and is regularly stocked. Large Canadian geese can often be seen in the spectacular rural and mountain scenery of Lake Chatuge. Lake Chatuge is located on the Hiwassee River in western North Carolina. The reservoir is named after a nearby Cherokee settlement.